Hey guys, it’s Ro! Welcome to another NerdyNummies! Recently, I have been playing one of my favoritechildhood video games, Lego Island! The main character is Pepper Roni! First name Pepper, last name Roni! so today we are going to be making a PizzaCake! but you can use whatever size you like. Thisis about the size of a medium pizza. You’ll also need some yellow buttercreamfrosting, and red buttercream frosting. little vegetable peelers, you know the peelers that you peel carrots or potatoes with. these ones are flavored strawberry, and someMilk Duds, now let’s put it all together! and then you just go back and forth! And then you’re gonna take off the top ofyour cake, oooh the best part! The muffin top! It’s going away, dang it! frost the top of the cake first. Then you’re gonna take your spatula andevenly spread it around the cake. and smooth it out to look like crust. spread it in the middle of our cake to looklike marinara sauce. and while it is chilling, we are gonna prepareour candy pizza toppings! favorite, and we’re gonna be making themout of the soft black licorice candies. the middle. And look at that! Looks just likea sliced olive! Now that we have a bunch of olives, now weare gonna be making our cheese! This is my favorite! Oh my gosh, I love mozzarellacheese! I’m just going to peel, peel. peel! cookie cutter and cut out some circles. And then just do this to the rest of your fruitstrips. first thing that we’re gonna do is put ona little bit of chocolate cheese! Oh my gosh! It looks just like a pizza, thisis just tripping me out! I make it rain, I make it rain, I make itrain! Now we’re gonna add our pepperoni! I really like pepperoni, so I’m gonna puta bunch of ‘em on here. Then I’m gonna put on our little sour gummies,kind of look like green peppers! Now milk duds, which kind of look like the little sausage. And last, but certainly not least, we’vegot our olives! These are one of my favorites! Stick a bunch of these on here! I loved playing that game when I was a kid, and stilltoday! This cake is such a cool idea! It’s reallygood for a pizza party, or a birthday party! I’ll be posting lots of pictures on Facebook,Tumblr, Instagram and Twitter. 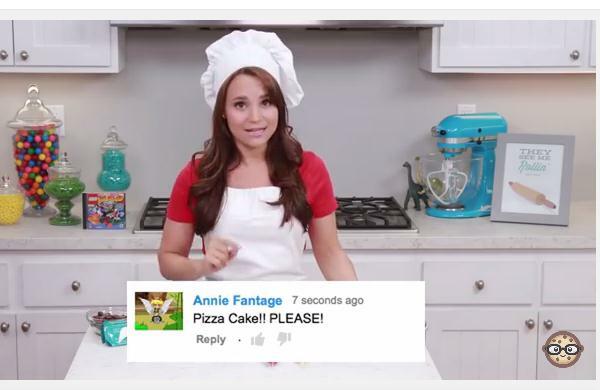 re-blog them and re-post them, I just loveseeing your baking creations. It just makes my day! see, please leave me a comment and let meknow and I will do my best to make it happen! Alright, thanks again you guys! Bye-bye!